A very nice music video featuring postapocalyptic Jugger. The good Czechs! Impressive. In fact, I am astonished that there is not much more music out with the Jugger feeling, in fact. Stuart, creator of the upcoming Jugger TTG soon coming live on Kickstarter (facebook link), was so kind to tell us a bit about himself. How did you get the idea of a Jugger TTG? I have been designing my own skirmish style game system for the last 20 years or so. Initially I was hoping for a more medieval / fantasy battle style game but as it progressed it showed that it was more suited to a smaller scale skirmish type of game. When I started playing Jugger I wanted to learn how to win. It was really clear to me that, even though I maybe ok in the duelling I had to learn the team tactics and strategy. So I created a miniature Jugger field and made some player tokens so that I could start forming strategies. It was then that the spark of inspiration hit and I started to blend my game system with Jugger!! I showed it to the other Juggers here in Australia and they loved it but it was still very rough and needed lots of work. But all the Juggers got in behind it and helped make it a reality. 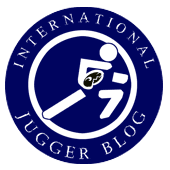 Does the scale the testing and participation of the Jugger community surprise you, did you hope for it, and is it according to your expectations? I have been totally amazed at the Jugger community. I don't think I have ever encountered before a community that have been so passionate and enthusiastic about their favorite sport and hobby. I was expecting that it would take a year to prepare, but with the Juggers involved Jugger TTG is ready to launch in under 6 months! Since when do you play Jugger? I have been playing Jugger since 2014. I wanted to play to practice my Arnis skills, so I was intent on becoming a dual short specialist. But an injury meant that I had to keep with a double handed pompfen. When I am duelling 1 on 1 I like to use the q-tip ... but when playing I prefer the long sword. As I have discovered recently I also am a good qwik because the Australian rules have a strong wrestling component to start a point. Do you have a team, team name? Tai Chi has the Jian sword form, so yes it has helped. But I have also trained in Arnis which has also helped. Add to that all the other weapons training I have done as well including Wushu staff. Do you plan to take part in tournaments, and do you plan to travel with your TTG abroad? Where to meet you or folks with test-playing boxes (of the finished game) abroad? As mentioned, we plan to visit the Juggers personally. If all goes well we hope to be in Ireland for their tournament and for the DM as well. Plans for the future in Jugger? 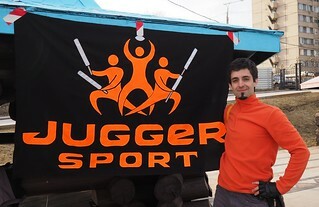 I would like Jugger to become a household name in the world of Jugger and also a highly recognized and loved game for tabletop gamers across the world. What we have on the planning table is to do 2 releases of new players every year based on the current top players and tournament winners across the world. Somewhere down the line I would like to have good resin miniatures of the main heroes and maybe even look at a Jugger digital game for ios or pc. We can hope and dream yes?